The iPad Mini was released out of the usual cycle because Apple had it hands forced. The success of the Nexus 7 following it’s launch in early July and the impending launch of Amazon’s Kindle Fire HD devices also meant that more of the 7″ tablet market demand would be taken over by Android if Apple did not react fast. Now that the Mini has launched and is now in a good position to capture more of the market, it makes more sense for Apple to revert to their original launch cycle. It is ideal for Apple to have three major launches a year to stagger their consumer demand cycle and also allow them to better manage their supply chain and logistics arrangement to cope with the demand for their products. The iPad Mini followed shortly after the iPhone (September) and the July cycle is often reserved for the Macbook Pro/Air. With this, there’s a significant gap in a year if Apple does not do a product launch in April. There have also been ongoing rumours of an iPad that follows the design of the iPhone 5 and the iPad Mini, with that dual-tone aluminium look. 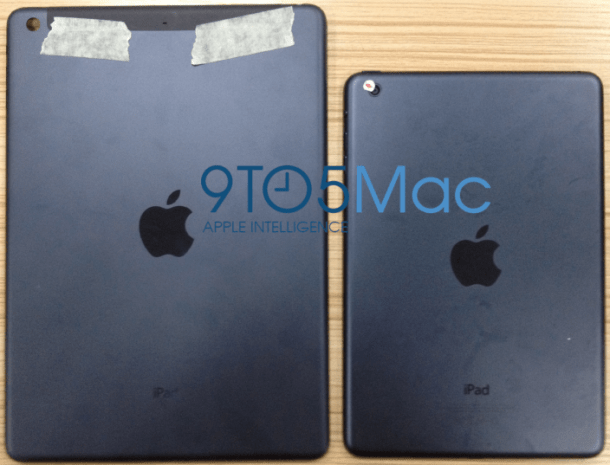 Leaked photos from a Chinese technology company show a black backing case for the iPad 5 in comparison with the iPad mini. The casing has rounder corners and edges, and is significantly smaller and shorter than the previous iPad. The bezel surrounding the screen is expected to be much smaller, leaving just enough room for the camera and home button, while allowing the screen to remain the same size at 9.7 inches. On the other hand, Apple has also bucked the trend with the recent news on the 128gb iPad. It is rare for Apple to do a product release at this time, just 3 months away from the anticipated launch of the next generation of iPads. Apple has used to stuck fervently to its release cycles but perhaps that has changed under the direction of Tim Cook. The 128gb SSD gives Apple some allowance in the price premium factor now with reduced storage prices and the release might give Apple some buffer for the iPad 5. The additional storage would come in handy for Full HD clips (you can store up to 30 full HD blu-ray quality movies), and perhaps with the iPad now being more recognised as a portable gaming device, would be able to accommodate some of those epic RPGs. Previously it was more likely for the iPad to be used in conjunction with a computer but now that is less so. This might justify the need for more storage as that would be the only device that a person may own and to keep the various videos, photos and documents. Well, if we do see an updated iPad in May, I am also hoping to see a second generation iPad Mini. As I previously mentioned, I believed the iPad Mini has all the potential for a great device (size, weight, design), just that Apple have shortchanged early adopters of the iPad Mini with poor specifications. It would be great to see a retina display quality on the iPad Mini with improved processor and not the old remnants from iPad 2 or iPad 3. If you could wait for a couple more weeks, it would be prudent to see if there are any additional rumours of the iPad 5 floating around before committing to a purchase. Looking at the last couple of Apple launches, we are hoping for similar leaks prior to the official release. It wouldn’t be nice to own a 1-2 month old iPad that became last season’s model.